EXCLUSIVE: Kodak (Alaris) up for sale! It appears that some or all of Kodak Alaris might be split up and sold, with an announcement regarding the sale of the PPF (paper, photochemicals and film) unit anticipated as soon as March this year. There have been no public announcements from Kodak Alaris other than the financial report it is obliged to lodge with Companies House (the British equivalent of ASIC). While researching a separate – but perhaps related – story on Eastman Kodak touting Australian photographers for direct film sales, Inside Imaging came across the Kodal Alaris financial report for the period January 1, 2017 to March 31 last year, which was lodged at Companies House in late December. However, Kodak Alaris CEO Marc Jourlait told Inside Imaging that since the financial report has been available on the Companies House website, key customers around the world have been privately briefed on the plans to ‘explore sales of some or all of our assets’ and that ‘PPF in particular we disclosed as at an advanced stage of negotiations with a potential buyers’. Kodak Alaris was spun off from Eastman Kodak in 2013 to market Kodak-branded photographic and business products. It owns the rights to use the Kodak brand. The sole shareholder of Kodak Alaris is the Kodak Pension Plan (‘KPP2’), a UK pension fund which acquired it for US$325 million in cash when it became clear that Eastman Kodak had no intention of honouring its pension (superannuation) obligations to current and former UK employees. Kodak Alaris is not the sole asset of KPP2, but certainly the largest. The trustees of KPP2 intend to hand over what’s left of the Kodak Alaris group – after attempts to sell some or all of the various business units – to the UK Pension Protection Fund. This is a government-run fund which looks after people whose pension funds have failed them. Whatever is left of the business after attempts to sell off parts of it will operate as a going concern under the Pension Protection Fund ownership, according to Mr Jourlait. He said that any sale proposals will need the approval of KPP2 trustees before that can go ahead. The KPP2 pension fund currently has a deficit of £1.5bil ($2.7 bil) which Mr Jourlait explained was a debt inherited from Eastman Kodak in the initial transaction five years ago. He was keen to emphasise that Kodak Alaris was a ‘profitable, cash generating business’ which had contributed dividends to KPP2 over the years. Nigel Moore, chairman of the trustees of KPP2 told FTAdviser last September that while the scheme could continue to pay pensions at the moment, ‘things will have to change in the future’. ‘The most likely outcome is that the plan will eventually move into the Pension Protection Fund,’ he said. In the meantime, the KPP2 trustees have instructed the directors of Kodak Alaris to ‘undertake the exploration of an orderly disposal of the Group or its component businesses…’ according to the Kodak Alaris document. ‘If offers reflecting the true value of the business are not received, then ownership of Kodak Alaris will pass to the (Pension Protection Fund) who will manage the asset in the same way as other scheme assets that are acquired,’ said Mr Moore. The four Kodak Alaris business units are: Kodak Moments (formerly Consumer Imaging); PPF (Paper, Photochemicals and Film); Alaris (document scanners); and AI Foundry (business software). PPF represents just under one quarter of sales, with the Kodak Moments business closer to one third or sales. Marc Jourlait noted there has been interest from more than one potential purchaser. The Kodak Alaris report puts a notional value of US$34 million on the paper chemistry and film business, noting that this is a conservative estimate. ‘Management is actively marketing the business and expects to complete a sale of the PPF business before 31 March, 2019. Changing circumstances may extend the time to complete the sale beyond 31 Marc h 2019 but management is responding to these changes and continues to be committed to the plan,’ stated the Kodak Alaris report. 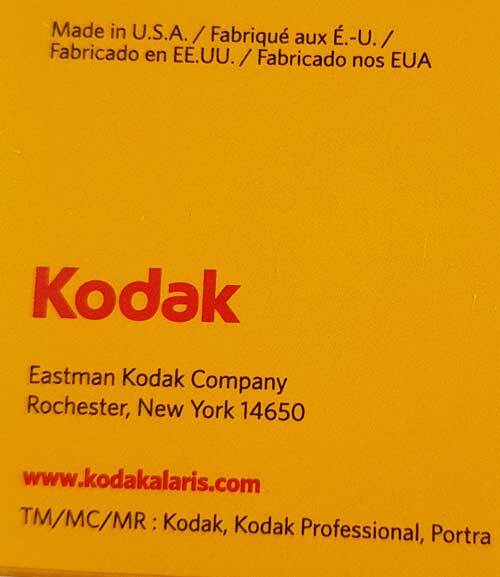 Kodak film continues to be manufactured by Eastman Kodak, as does Kodak silver halide paper stock. This is supported in a bulletin to KPP2 pension holders on January 19 this year informing them negotiations with a potential buyer are in ‘advanced stages’. In the financial data sections of the report, PPF was already being classified as a ‘discontinued operation’ in 2017/18 figures. The Kodak Alaris report refers to PPF in some sections as ‘Held for Sale’ and in others as a ‘Discontinued Operation’. The PPF group no longer actually manufacturers paper, chemistry or film. It closed its Harrow, UK manufacturing plant in 2016 and now outsources all manufacturing except for the operation of a paper finishing operation in Brazil, shared with the Kodak Moments group. Eastman Kodak is its key supplier for paper and film. The financial report, which covers a 15-month period, saw Kodak Alaris generate revenues of US$836 million, but post a loss after tax of an astounding $192 million. (So for every $10 it made in sales, it lost around $2!). Kodak Alaris only ever managed to turn an after-tax ‘bottom line’ profit in 2017, when it delivered US$7 million on over US$700 million in sales. Overall bottom line losses have been massive, continuing in the tradition of Eastman Kodak in its last 10 years. However, Mr Jourlait disputes the relevance of these ‘bottom line’ figures, pointing out that EBITDA (earnings before interest, tax, depreciation and amortization) is a better measure of a company’s financial performance and by that measure, Kodak Alaris has been performing well and generating cash and profits. Another cost saving measure mooted is to pull out of various markets: ‘commence to exit some countries and legal entities…where the business opportunity is outweighed by the costs of making a position or footprint.’ Mr Jourlait noted that global businesses regularly change distribution arrangements from country to country and this was nothing extraordinary. Hey Keith, excellent international scoop, plus eliciting a response from KA worldwide CEO before any other comment to the market. Keep up your great work of informing the photographic community of what we need to know. Lasted longer than when Agfa-Gevaert “sold” to AgfaPhoto at least they lasted longer, but it appears no profit has been turned in years. But like AgfaPhoto Alaris was only a sales agent and not in control of manufacture. Wonder what Eastman Kodak’s profit was during that period with what they supplied? I think PG is exactly right. Alaris just seems to be a distributor. The loss of Alaris only would only hurt the retirees, staff and other debt holders. As long as the manufacturing exists it is probably a non-event for consumers or dealers. These “financial engineering” deals are always on shaky ground and are like PG’s Agfa example, a way to jettison bad financial decisions or inability to compete. Well the Euro-Millions lottery is over 100 000 000 tonight so maybe the winner (me?) could buy Kodak Alaris. I had no idea it was owned by a UK set up. It won’t be for long if it is doing OK – we flog anybody anything. I have been using their film for years. lately (yes, i still use film from time to time) there were lots of defective rolls. The service was also a disgrace – they were sellong defect film for years while knowing it – no recalls. not sure where they manufacture but its clearly not working – if you are considering purchasing this enterprise – please beware.